CenterStaging in Burbank, California, is an L.A. rehearsal and backline facility specializing in production and technical support for television and live performances. Recently they took delivery of the M-5000 OHRCA Live Mixing Console from the Roland Professional A/V Division. They’ve already been putting it to use, notably during rehearsals for the BET Awards. 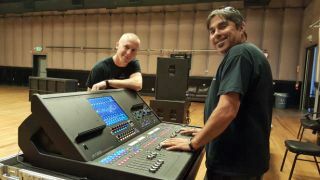 Will Kerlick, CenterStaging Business Manager, and Doug Dubin, CenterStaging Audio Manager, with CenterStaging’s new Roland M-5000 OHRCA Live Mixing Console. The Roland M-5000 Live Mixing Console is based on the OHRCA platform. “OHRCA” stands for “Open, High Resolution, Configurable Architecture,” and the M-5000 has freely definable audio paths, supporting multiple audio format protocols and offering 96 kHz sound quality throughout the system. The Roland M-5000’s internal mix architecture is not fixed and can be freely defined for mixing channels, AUXs, Matrices, subgroup buses, and MIX-MINUS buses within a range of up to 128 audio paths.The M-5000 has two built-in REAC ports, plus two expansion card slots with seven expansion card options including Dante, MADI, Waves SoundGrid, or more REAC ports, as well as audio embedded over video protocols. The back panel includes 16x16 analog I/O, 4x4 AES/EBU, a 16x16 USB audio interface, connection for control via an iPad connected or wireless, and control ports including footswitches, GP I/O, RS-232C and MIDI. All of this capability enables the console to see up to 300 inputs and 296 outputs, all at 96kHz and even more at 48kHz.